The past is a good predictor of the future. That’s why I wasn’t surprised to see some second-guessing by the Wayne County commissioners over investments made in the industrial development authority (IDA). Putting current personalities aside, 30 years ago, I had a ringside seat in a similar situation. No, I was—along with other IDA members—in the ring, tussling with commissioners who begrudgingly provided funding and second-guessed our spending. If you weren’t around in the mid-to-late 1980s, here’s how it went. Candidates campaigned on promises to attract more industry. The IDA, appointed by the commissioners, was sent into the competitive fray for more jobs much like hunters going after bears with BB guns. Economic development is not for the fainthearted, impatient or tight-fisted. Bringing jobs to town or saving threatened paychecks takes plenty of pluck and dollars to back it up. Every budget cycle was a tug-o-war to secure IDA funding. Private dollars were raised to promote a solution through a local referendum. The voters bought in. Legislation was drafted but watered down at the last minute. Rather than requiring the county commissioners to levy one-half mill annually for economic development, the law was altered to say “may” levy one-half mill. The bait-and-switch kept the IDA hobbled—year after year—hoping there’d be money to carry out its mission. I was one of the fussy activists. Hoping to silence me, the commissioners appointed me to the IDA. Right away, I could see the authority was passionately dedicated. Sonny Harris, J.L. Boyette, James Harper, George Brantley and Charlie McKenzie were doing their best, but with a flat IDA wallet. As much as the IDA needed money, it needed a full-time professional spark plug. In 1984, we went after the best person available. We lured Bill Durrett out of Tifton. Sure enough, some commissioners pouted. We paid Bill $37,000—about $5,000 more than the county administrator. That didn’t help our annual hat-in-the-hand campaign. Bill helped get the IDA focused. He tended to the details. Bill took our story on the road, opening doors in Atlanta and elsewhere. Swimmer David Larson’s winning an Olympic gold medal that summer added excitement and another positive talking point. Before long, multiple possibilities—and needs—surfaced. Glynn County frowned on a proposed federal prison. The IDA thought: “Let’s go for it.” One commissioner set his jaw and told me, “You are wasting your time. That facility is going to be built in Florida.” About two dozen volunteers thought differently, purchasing their own airfare to Washington, D.C. to lobby for what is now FCI Jesup. If the believers had listened to doubters around the commission table, well, those paychecks would be cashing elsewhere. 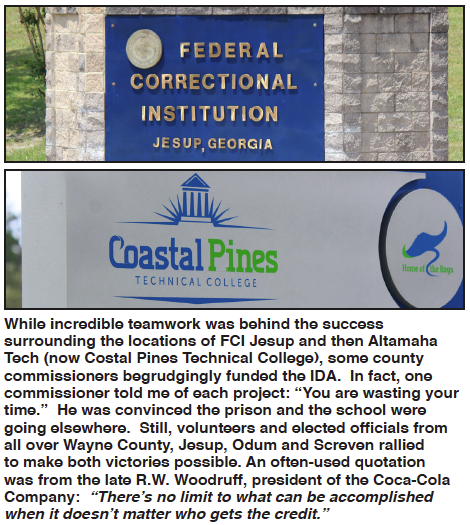 And when we got into the fray to win the technical college, that same commissioner pooh-poohed the effort. He scowled, “You’re wasting your time. Sen. Joe Kennedy has promised the school will be built in Glennville.” “Have they broken ground yet?” I asked. “No,” he said. I countered, “Well, it’s not too late to try.” You know the rest of the story. Dozens of eager, unselfish men and women made it happen. The IDA was questioned when it built a speculative building. Still, a buyer surfaced in just eight months, bringing a new payroll. When the IDA pushed for much-needed airport improvements, a few county commissioners pushed back: “Airports are for rich people.” They didn’t understand airports that can accommodate corporate jets are necessary magnets to pull in prospects. The records will show that $100,000 investment has been repaid—over and over and over—through increased ad valorem taxes. The IDA team worked on this, but James Harper was our persistent point guard. So, how do we get through this? The answer is one word: leadership.